The CPX lockable line valve is manufactured in the UK under BS EN 13485 Medical Devices: Quality Management Systems and CE marked with notified body British Standards Institute under the Medical Device Directive 93/42/EEC (CE0086). They are designed to have a tight shut off and blow out proof stem for protection against pressure surges. 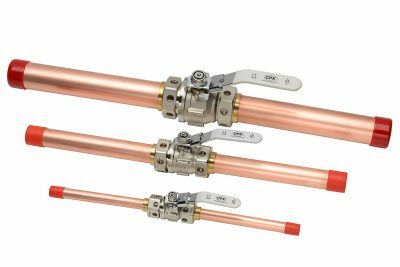 They comprise of a 2-piece full bore male threaded nickel plated brass ball valve c/w chrome plated brass ball, blow-out proof stem, stem O-ring, Teflon® ball seals and flat face copper stub pipe assemblies. 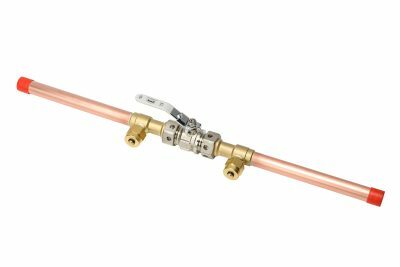 The copper stub pipe assemblies are manufactured from medical gas copper tube compliant to BS EN 13348 and are factory soldered to brass flat face seal housings chemically cleaned and degreased. The copper pipe stubs are of sufficient length to enable brazing directly to the MPGS utilising flux less brazing to WKO (82) 1. Flat face housing incorporate Nitrile® or Viton® O-ring seals ensuring 100% gas tight connections. The chrome plated valve handle is lockable in the open or closed position by way of a sliding device and a brass padlock is provided to prevent unauthorised or inadvertent operation of the valve. For ease of installation all brass padlocks are the same size for the full range of ball valves from 15mm to 108mm. All line valves are fully pressure tested for valve tightness and leakage and batch numbered for traceability prior to packing and delivery. They are individually end capped and sealed in a clear polythene bag to maintain cleanliness. 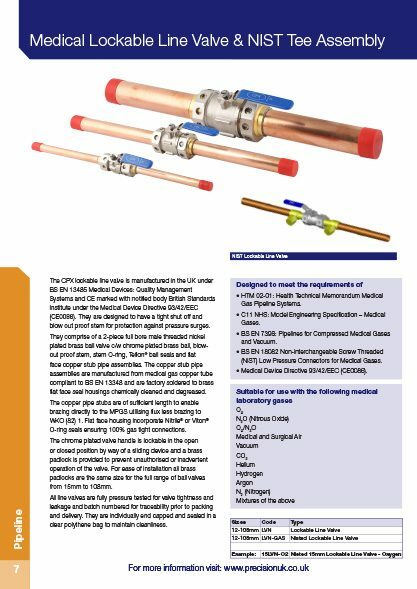 HTM 02-01: Health Technical Memorandum Medical Gas Pipeline Systems. C11 NHS: Model Engineering Specification – Medical Gases. BS EN 7396: Pipelines for Compressed Medical Gases and Vacuum. BS EN 18082 Non-interchangeable Screw Threaded (NIST) Low Pressure Connectors for Medical Gases. Medical Device Directive 93/42/EEC (CE0086).